(XS) vintage 1970s mens short sleeve DISCO SHIRT! Shiny Black w/ White Mesh Flames! Home > Items just added 4/3-4/17 > (XS) vintage 1970s mens short sleeve DISCO SHIRT! Shiny Black w/ White Mesh Flames! Mens vintage 1970s short sleeved disco shirt. 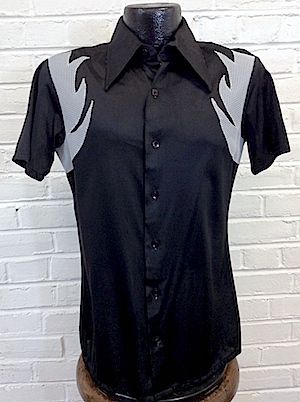 Burn up the dance floor in this shiny black disco shirt with white mesh flames on the shoulders! ! Has a brown-ish black buttons. Shirt has a tapered hem. 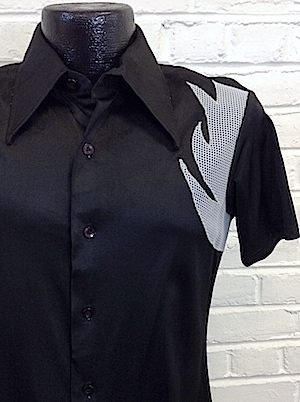 Please note the material the shirt is made through is somewhat shear and may need to be worn with an undershirt. Tagged by AUB. Arnel/Nylon blend. Condition: Very Good. Top button hole has come undone a little bit and there is a small pull in the upper left, front part of the shirt. Does not detract from the awesomeness of this shirt! Please note, shirt is tagged a M, however, we are measuring both the shoulders and chest at an XS.